We will be live from Key Arena starting at 5:00 pm PST. Follow us on social media below. 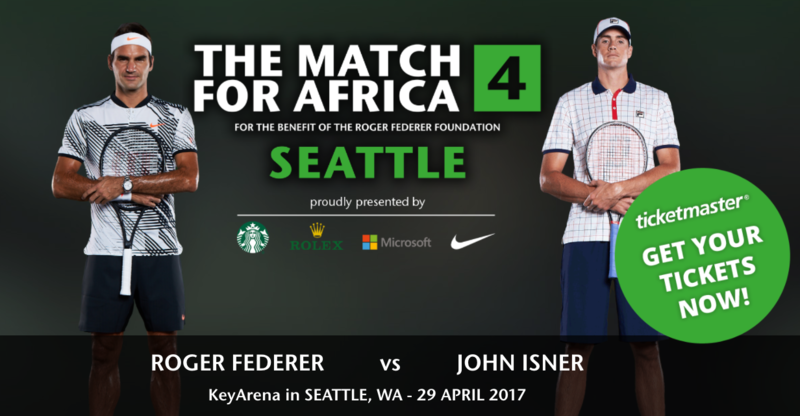 “The Match for Africa 4 Seattle”, the fourth charity tennis event for the Roger Federer Foundation, will be held on Saturday, April 29, 2017. Roger Federer’s opponent in the KeyArena in Seattle will be none other than the winner of 10 ATP Titles John Isner. Roger Federer will make his inaugural visit to Seattle in collaboration with Seattle’s own Bill Gates. Net proceeds from this event will go to the Roger Federer Foundation. The Match for Africa 4 Seattle will start at 5:30 pm PT on April 29, 2017.